ANSA conducted an seminar for its students to expose them to the additional qualifications that they can aquire along with ACCA. The session was conducted by Dr.R.S Murali, Director of ANSA. 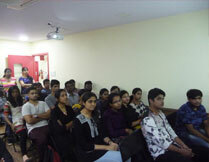 The seminar was well received by the students and brought to light new opputunities for additional qualifications.